And I am happy to say that all the products used on this card, with the exception of two or three, were purchased at ScrapbookPal.com. 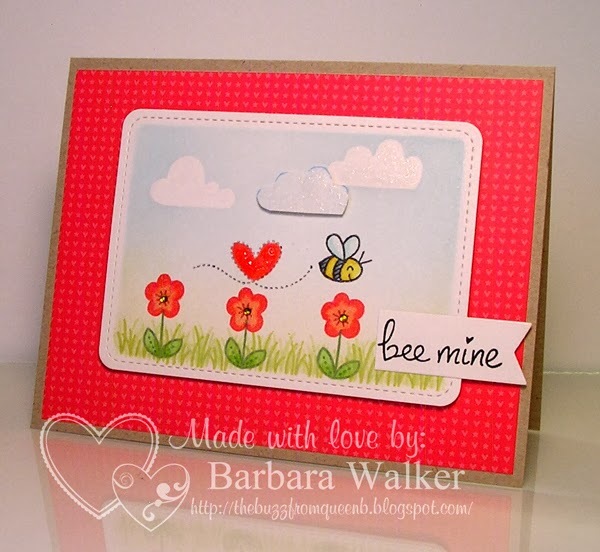 I used the Bee Mine stamp set to create a little scene. I love bees. But, then you probably know that, by looking at my blog. Anywho...this was quick and easy to put together. First, I die-cut the rectangle, using the Stitched Journaling Die. Then I stamped the clouds onto some masking paper and fussy cut them out. I placed them onto the card stock and with the card stock still in the die, I brushed on blue and green Distress Inks. I removed the masks and die to reveal the white clouds and the base of my scene. I also stamped an extra cloud and fussy cut it out and adhered that to the focal panel to add a bit of dimension. Next, I stamped out the flowers and grass. I used two different colors of green ink on the grass and offset it a bit to add fullness. I stamped the bee and its' flight trail in black ink and then colored everything with Copic markers. I stamped the sweet sentiment in black, too and then die cut the banner using another one of the dies in the Stitched Journaling die set. 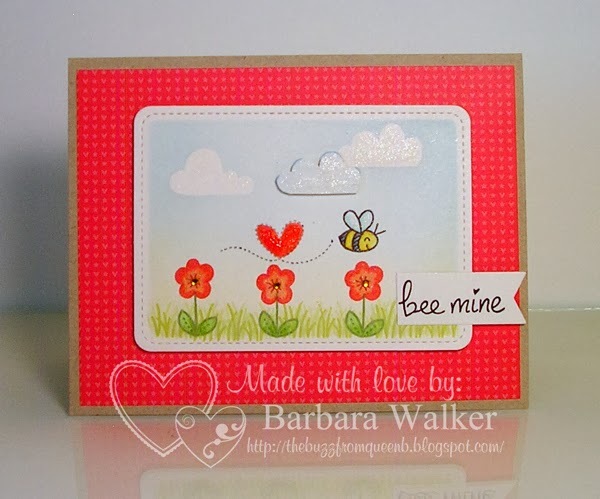 And finally, I adhered the focal panel to my card base with dimensional adhesive and added Stickles and Tiny Twinkles and gave the bees wings and the flowers a touch of sparkle from my Wink of Stella glitter brush. Fun! Fun! Fun! I hope you all are having a wonderful Valentine's Day! I am...doing what I love and being with those who love me! It's a great day! That's it for me! Have a wonderful weekend! Hi Barb, I HAVE to remember to check out Scrapbook Pal, more so now because my fave place to get Lawn Fawn locally is closing in a few days. (sniff, sniff- :( )I adore this card! Adore! It is so happy and springy and I love your clouds. Well, I love all the details, but for some reason how people create clouds is fascinating to me lately. Do you use anything special as your mask(s)? Excellent work, sweet friend! This is the cutest scene, evah, Barb! I just love your cloud masking. The little bee looks so happy making it's across the flowers. That heart is adorable:) Good luck in the contest!